In the Fall of 1909, Samuel R. Gault (shown at right), Scottsville's postmaster and a local farmer, concluded that a creamery might prosper in Scottsville. 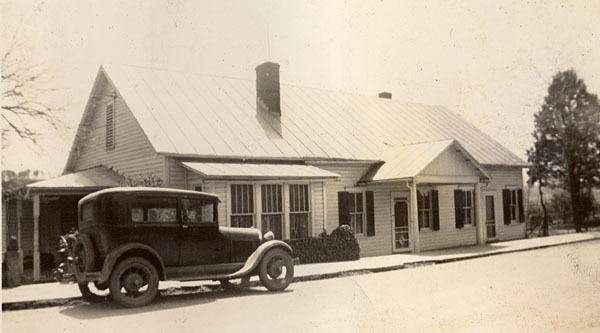 He incorporated a creamery in Scottsville with $5000 capital and appointed himself its general manager (Reference 2). Gault continued securing additional subscribers for the creamery and thus more funds became available for constructing one. 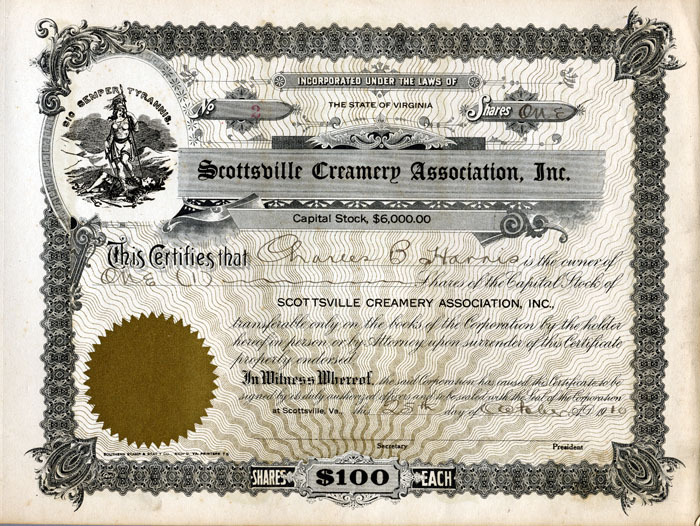 Shown below is one share in the Scottsville Creamery Association, Inc., which was purchased by Scottsville businessman, Charles B. Harris, on 25 October 1910: On 1 November 1910, Gault reincorporated this business as The Scottsville Creamery Association, Inc., with $10,000 capital stock provided by D. H. Pitts, D.A. Langhorne, S.R. Gault, and W.S. Dorrier as major stockholders (Reference 3). 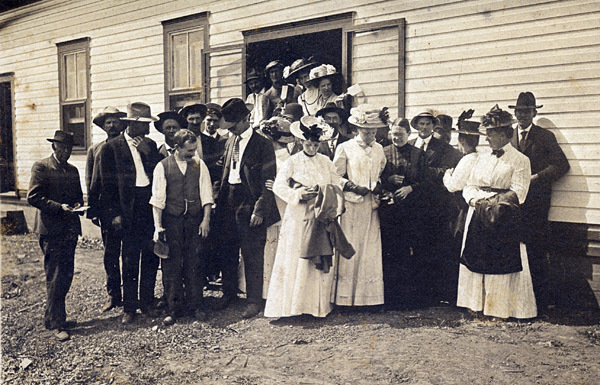 In December 1910, the Virginia Dairy and Food Commissioner, Wm. 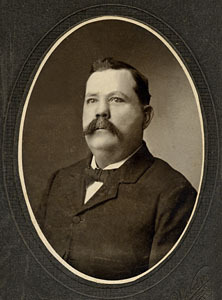 D. Saunders, reported on the results of his Department's inspections of creameries and dairies in Virginia: "The Department in making inspections of creameries has a double purpose in view -- first to see that sanitary conditions are maintained, and further that all products sent out from the creameries are free from adulteration and comply with the standards set for such products. Secondly, that all creamery operators, as far as it can be done, be shown how to produce better products with the idea that the butter, cheese, and other creamery products be improved in quality. While development along these lines appears to be slow, still there seems to be material advancement of the dairy interests in the State. In almost every case in which the farmers have persisted in dairying, prosperous conditions have resulted. The land has increased in productiveness and consequently in value, the herd has increased in productiveness and consequently in value, the income per cow has been advanced and an air of general prosperity has surrounded such farmers." "It would seem that this report would hardly be complete without some mention being made of promoted creameries in the State which have been built, equipped, operated for a short time, and then closed. It is an old story -- the creamery promoter drops down in a community and starts to work; he usually has an agreement which provides that after a certain number of subscribers have been secured, agreeing to pay such amounts as may appear opposite their names, same being filled in when their names are subscribed to the paper, that he will proceed to build and equip a creamery, same to be turned over to a committee representing the original subscribers. This is usually done without any special reference as to how many cows are necessary to support a factory of this kind. The subscribers to a paper of this kind usually come up when the creamery is finished and pay their subscriptions when the creamery is turned over to them. It usually happens that not a single man has more than $100 interest in the creamery and that none of them know anything about the business in any of its details. The fact that none of them have other than a small interest in the business, means that as a rule no one person will devote any considerable time to the further development of the enterprise. The creamery is usually opened as agreed by the promoters, they supply an operator for a certain period when the stockholders are supposed to provide one. These promoted creameries for the most part open with a few patrons, frequently only a small number of the subscribers being patrons of the creamery. It soon appears that the creamery is not doing what it was expected to do and whatever interest may have been created by the promoter very quickly subsides and those who may have started in to supply the creamery with milk, finding that the expense of operating the creamery is out of all proportions to the sales, drop out one by one until it soon becomes apparent that the amount of milk supplied is entirely inadequate to support the operation, when the creamery is closed. This has been the history of a number of promoted creameries all over the country, and it is remarkable that farmers today are still being induced to subscribe to these enterprises without giving the matter consideration from every standpoint. The Department has endeavored to assist these creameries and if possible bring them to the point of paying. In some cases the advice of the Department is asked before subscribing to the stock of these creameries; in many cases it is shown conclusively that the community is not ready for a creamery and if one should be built, it would not be supported." The entrepreneurs that started the Scottsville Creamery surely were well intentioned as they envisioned it as a needed industry to convert farm dairy products to salable milk, cream, and butter for the area's needs. However, Scottsville Creamery appeared to struggle with its milk supply (in 1910, it received one of the lowest milk poundage in the State), and it also produced only one salable product: butter. According to Reference 5, butter sold for approximately 35.9 cents per pound in 1910. If Scottsville Creamery's sold all of its 1910 butter production (9,984 lbs), its gross revenue would have been approximately $3584.00 before subtracting expenses (i.e., the cost of milk received, any creamery worker's salary, equipment purchased to process the milk, transportation costs for the butter, etc.). In its first year of business, the Scottsville Creamery's sales and limited patrons (15) do not seem capable of even beginning to cover the expense of operating the creamery. Indeed Scottsville Creamery seems to have been a prime example of the small towns that Commissioner Saunders described in his 1910 report, i.e., the Scottsville community was not ready for a creamery and could not support it. 1) The Times Dispatch, Richmond, VA, Sunday, April 11, 1909: "Scottsville Wants New Industries." 2) American Produce Review, Vol. 29, October 27, 1909-April 1910; p. 192. 3) The National Provisioner, Vol. 1, November 6, 1909; p. 22. 4) Annual Report, Vols. 2-3, by the Virginia Dairy and Food Commissioner, December 31, 1910; pp. 14-17, 31, 33-34, 87,191. 5) U.S. Bureau of the Census, "Historical Statistics of the United States, Colonial Times to 1970, Bicentennial Edition, Part 2" , published by the Bureau of Labor Statistics, 2011.